"Monetary concerns are looming in town as it enters the fiscal 2020 budget season. Officials expect another deficit, but are working to make sure the trend doesn’t continue. There are no numbers out for the fiscal 2020 budget, but town and school districts offices are discussing proposed figures that will be available in the next month. The approved town budget for 2019 is $124.2 million, with the school budget accounting for approximately $63 million. Officials used close to $1.5 million from a stabilization account to balance the 2019 budget last cycle. 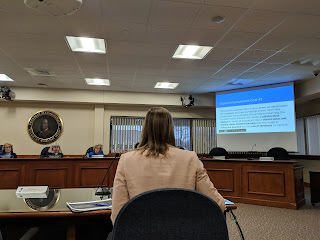 Schools Superintendent Sara Ahern plans to present her recommended fiscal 2020 budget to the School Committee meeting on Tuesday. The budget is expected to be discussed until a final decision is made at the committee’s March 12 meeting, when the members will vote. There will be a public hearing on the budget on Feb. 27." The Superintendent's budget proposal is not yet available on the meeting packet page. It usually is posted the morning after the meeting.